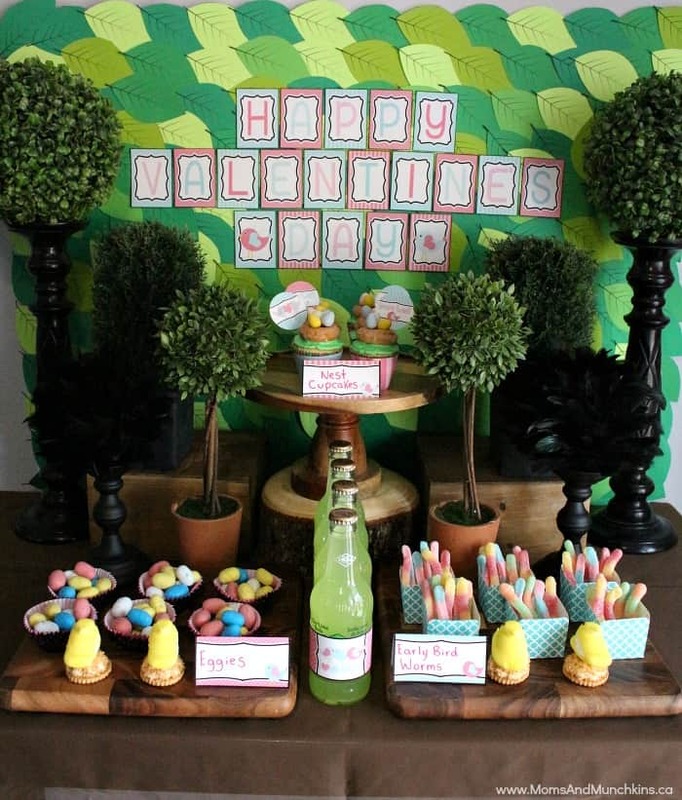 A Love Birds party theme is such a sweet (or should I say TWEET) idea for a Valentine’s Day party! Yes, all of the party printables shown here are available for free from Mimi’s Dollhouse – go here to print the free party package. Don’t miss the free printable love birds game at the end of this post! 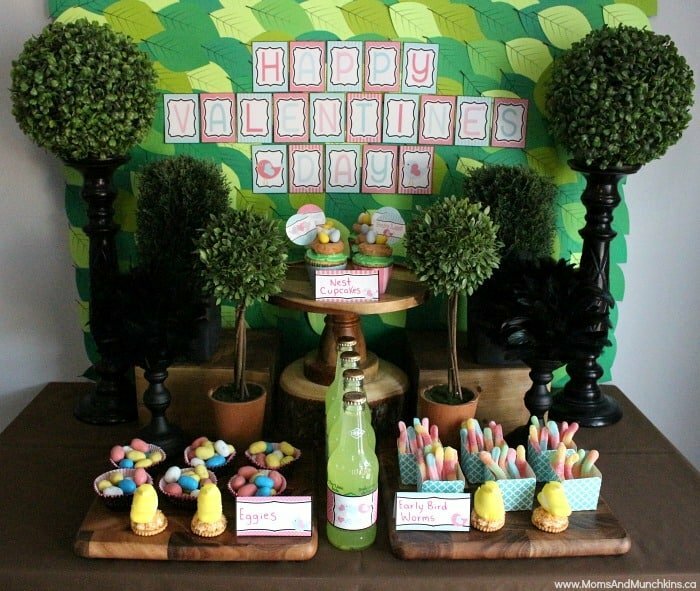 If you’re just planning a Valentine’s Day party for your family, a cute idea would be to leave invitations on your child’s pillow and in your husband’s briefcase. The free printable party package includes an invitation that you can write all your party details on. 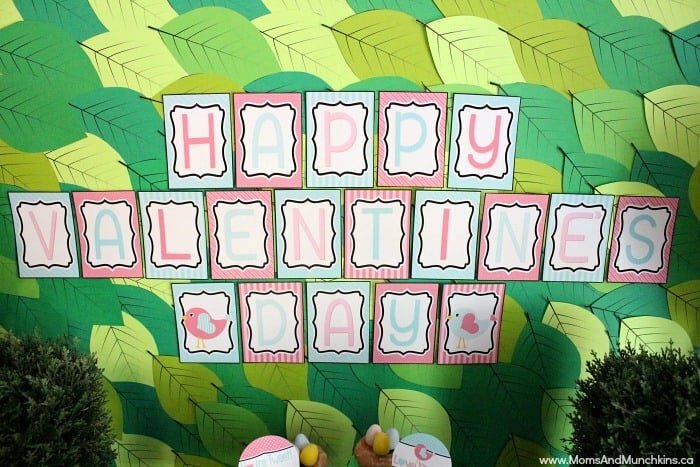 For decorating this theme, I created a backdrop out of printed leaves I cut out plus the Happy Valentine’s Day printable banner. Then I used some fake plants, plus wooden serving trays for the food. 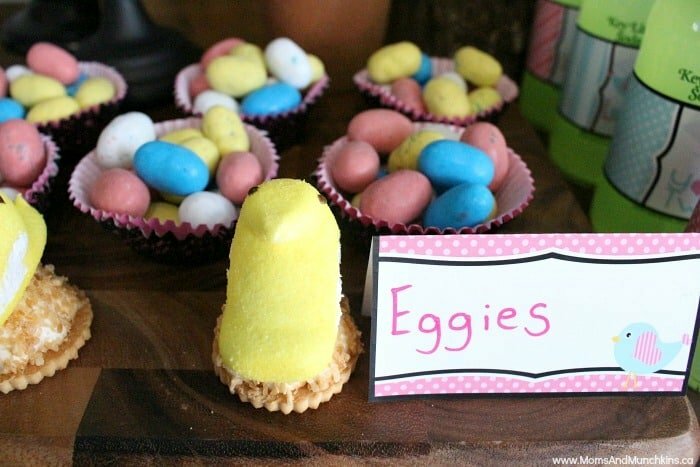 One of the great things about all that Easter candy that is already on the store shelves is that so much of it would be great for a Love Birds party theme – chocolate eggs, marshmallow chicks, etc. 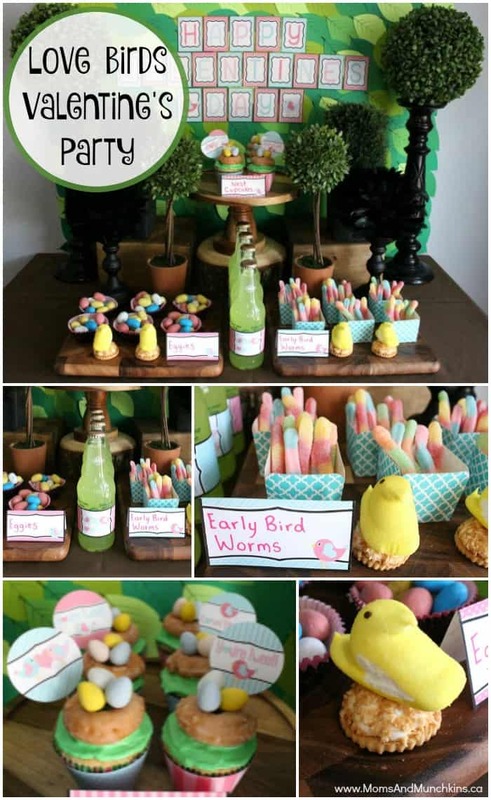 Snack ideas for the party could include cupcakes with the free printable cupcake toppers and wrappers, coconut “nest” cookies topped with marshmallow chicks or jelly bean “eggs”, pretzel sticks labeled as “twigs”, and gummy worms labeled as “Early Bird Worms”. 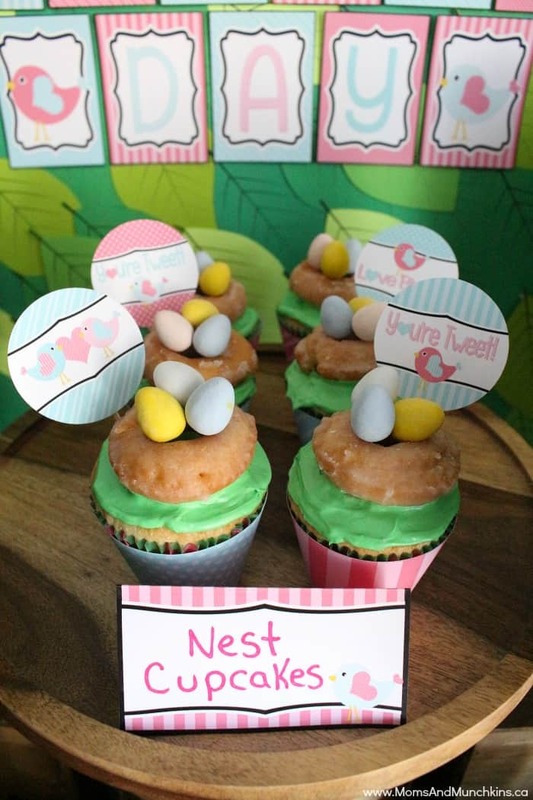 For easy birds nest cupcakes, I used mini donuts as the “nest” on top of the cupcakes with mini chocolate eggs. 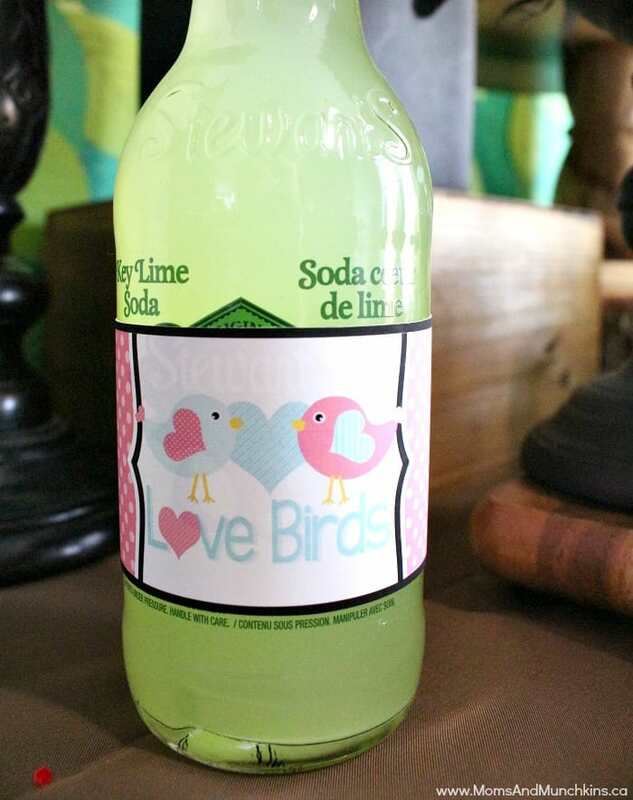 The bottle labels could be used on water bottles or soda pop bottles. A fun game for your love birds party is to match famous love birds. I’ve included a free printable game that you simply print and cut along the dotted lines. You can then tape 1 person from each famous couple on a poster board and scramble their partners (hint – all of the love birds are side by side on the printable to help you with the correct matches). Guests then take turns trying to pair them up correctly by sticking the love birds side by side. A big THANK YOU to Holly of Mimi’s Dollhouse for being so tweet (sorry, I had to do it!) 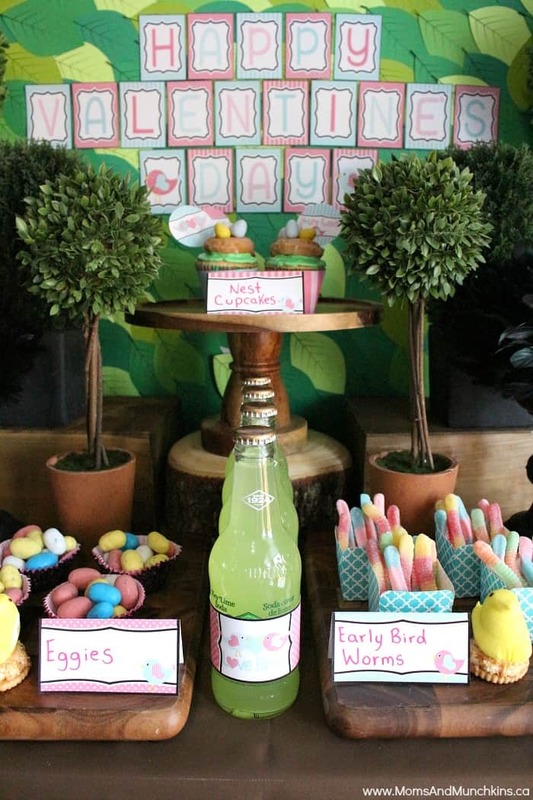 and sharing this free printable party package with us. 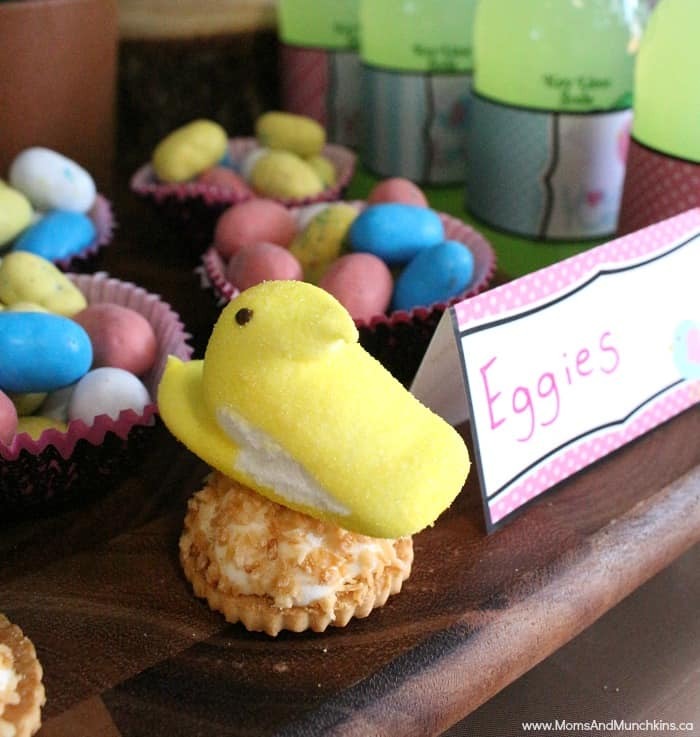 There are so many more pieces to this free printable party package so be sure to check it out. For more fun ideas for Valentine’s Day including party ideas, free printable games, delicious recipes, activity ideas and more – visit our special Valentine’s Day page. Stay updated on the latest ideas for holiday fun by following along on Facebook, Twitter, Pinterest and Instagram. everything looks so cute! 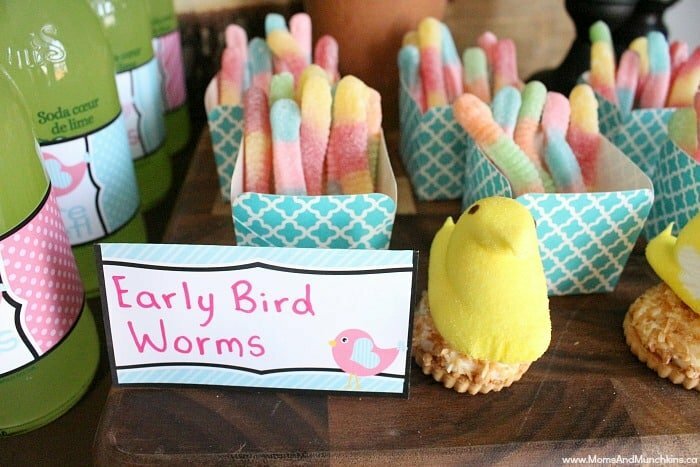 when I see the word tweet I always think of twitter, an adult variation would make for a cute Tweet Up party! That is tweet 😉 I love the design options. Love free printables! Great post. Oh my gosh! I totally bookmarked this! You always have so many great ideas!!! I love the water bottle labels! What a cute idea! GREAT ideas and post, I too love the water bottles. So creative.